I was very happy to discover today that my local Chinese supermarket stocks Sichuanese ya cai 芽菜, a speciality of the southern Sichuanese city of Yibin, and a vital ingredient in dishes like dry-fried green beans 干煸四季豆 , dan dan noodles 担担面 and dry-braised fish 干烧鲜鱼. You can use other Chinese preserves, like Tianjin preserved vegetable, as a substitute, but they are not as good as the real thing. Here, the preserve is sold in little sachets, chopped and ready to use. Apparently the shop had been selling it for some time, but I hadn’t noticed! If any of you have tried asking for ya cai in Chinese shops, you may have found that the staff there point you in the direction of beansprouts, causing great confusion on both sides. This is because the Chinese characters for Sichuanese ya cai are exactly the same as the characters for beansprouts, and most people outside Sichuan have not heard of ya cai! Perhaps my photographs of the sachets will help you track it down. A delicious supper of odds and ends this evening: some butternut squash with dried mustard greens and bamboo shoots leftover from a dinner party last night, mushrooms stir-fried with garlic, steamed broccoli with sesame oil, and fried eggs with gan lan cai 橄榄菜, one of my favourite relishes. With rice of course. It all took about fifteen minutes. Thanks for this. I had the bean sprout problem happen to me when shopping for ya cai in Queens, New York a few months ago. I suspected it was because most of the Chinese people in NYC are Cantonese and might not know about Sichanese ingredients. I wound up using the Tianjin instead, but now I’ll print out this photo and see if I can find some real ya cai. Looking forward to delicious Dan Dan Noodles again. Which shop is stocking ya cai? Do you know if anywhere in Chinatown is now stocking it? There also seems to be an increasingly wide choice of Pixian bean pastes now available. In which supermarket did you find this? Yes, thanks! Kathryn, I am in the same boat — if you do find a NYC source, I’d love to know. This identical brand and package is found in New York and Chengdu. It was also the one used at the Sichuan Institute of Higher Cuisine when they demonstarted dan dan noodles, so apparently there is only one manufacturer of Ya Cai in the world. In any case its certainly delicious in dan dan noodles and i’ve found it keeps in the fridge even after opening. Unfortunately where I live now ingredients like this are precious & rare. I try to obtain things via mail order when I can. However since you’ve kindly provided the picture, I will mail it to family & friends in the NY area & see if they can find it & perhaps mail it to me (which I do with several other foods I can’t get here). mel, in which store in NY did you see it? Kathryn- Try the Great Wall supermarket in Flushing, on Northern Blvd at the intersection with Union St. -go to aisle 4. They had plenty in stock on wednesday evening. You’ll likely find them in other stores in Flushing or in the Kam Man Supermarket in Edison NJ but Great Wall is a good one-they have a excellent stock of seafood, meats ,veggies etc and most important , a free parking lot. I shall get myself to Yu Xiao this weekend. Not noticed it there myself, although haven’t been looking if I’m honest. Thanks for the suggestion. This turned out to be in the bin right next to the yacai I’ve been buying (niuhua yacai, in a clear plastic package) at Ming’s in Boston, but I never noticed it before! Even better, it was on sale when I looked. 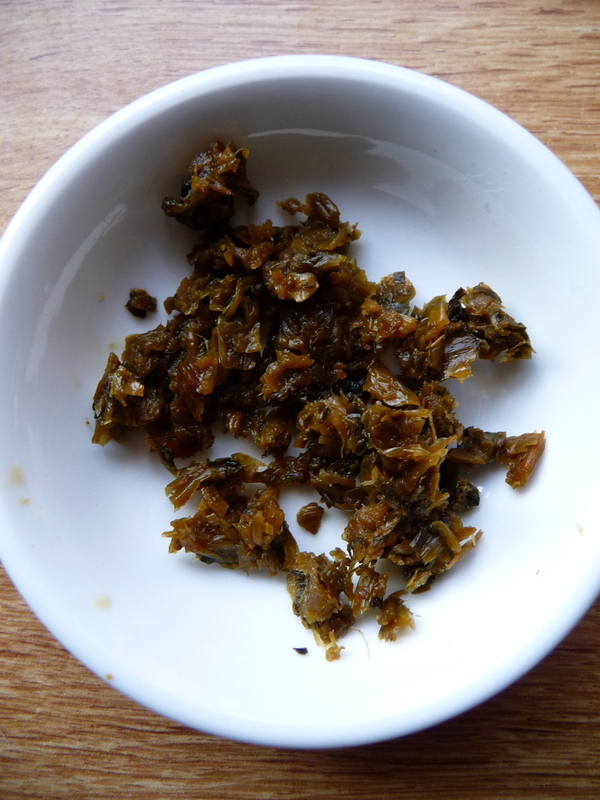 It’s amazing how many different forms of preserved mustard there are in Chinese food, all tasty. I also managed to find the box from a package of yacai that my Sichuanese officemate found at C-mart in Boston Chinatown a couple of years ago. I’ve never seen it in the store, but it appears to be available from orientalfoodmaster.com. When you open this box, the vacuum pack inside looks and feels like it contains a dark, gelatinous goo—very forboding. But it turns out to be whole rolled leaves, pickled and compressed into a tight cake. This is the same brand I use too. Glad to know it is the best around! I asked Chinese friends returning to Beijing to bring some back for me, but after much hunting and blank looks from shopkeepers, they were told that yacai could only be found in Sichuan. Glad we can get it here in Hackney! I am not too far from Kingsland High Street! Thanks for the info! My Chinese girlfriend found the exact same brand at the first Asian supermarket I took her to, here in Dallas, Texas. I use it in my noodle/egg/sausage concoctions, along with pickled olive leaves and chili peppers. Delicious! I live in San Francisco’s Richmond District, an almost exclusive Chinese enclave, yet the local Chinese ‘mega’ grocery,’ May Wah Market does not carry this. This is bewildering because this marks the very first time my searches have come up empty. Can anyone in San Francisco offer any suggestions? I tried two found in local supermarket. The same one as Fuchsia’s picture is a real one and can also be found at http://posharpstore.com/en-us/sui-mi-yacai-35oz-p1434.asp. Another one as shown at http://posharpstore.com/en-us/spicy-king-yibin-yacai-15-bags-p1946.aspx is completely different, just like a regular pickled veg. If you’re in London you can get them at The New Loon Moon supermarket, 9A Gerrard Street, London W1D 5PN (ie in Chinatown). They’re in the upstairs section not on the ground floor. 60p a packet. Just bought some today. Enjoy ! Can anyone recommend an online grocery store in the US or one that will ship to the US that carries ya cai? I’ve been looking everywhere. The three Chinese groceries in my town all showed me bean sprouts as well! Fuschia – why don’t you have your own online store?! Pacific Trading in Elmhurst, Queens (not the one near the subway hub at 74th, the one in the little plaza) has yacai, in this exact package — bottom shelf toward the back of the store in the aisle with various packets of pickled things & dry things, if that makes sense (it’s surrounded by several brands of pickled radish). I’ve used your books to track down a bunch of delicious ingredients in the wonderland that is Flushing, Queens. Now that I have ya cai: How long will it last in the fridge in its packaging? I just tried it with plain rice recently and it was amazing as you’ve said. I just got bought three packets exactly as Fuchsia pictures above at the Hong Kong Supermarket in Manhattan’s Chinatown (68 Elizabeth Street). I spent about 20 minutes going jar by jar in the aisle where I thought they’d be. I gave up and asked a clerk (in Chinese) if they had “Yibin Yacai.” He knew exactly what I was talking about, and pointed me in the right direction. If you find yourself there, they are sold in these small packets (about 5″x5″) on shelves directly across from the butcher counter near the registers at the front of the store. It may require some digging, as the shelving wasn’t too organized. I can’t wait to christen a package with some dan dan mian! After searching through all 5 Chinese supermarkets in Leeds (UK) and getting many confused looks and directions to bean sprouts by the shop assistants I finally road tripped to Manchesters Chinatown yesterday and found a really friendly supermarket called Wing Fat on Faulkner Street who had this Yibin Yacai and 2 other varieties tucked away on the bottom shelf of the preserved veg! So excited to finally be able to make dan dan noodles again!! I bought what I hope is yacai on the exact spot Jose described in his 14 march 2014 post. The bag looks a lot like the one posted by Fuchsia, but is not identical. Is it a copycat brand, or something completely different? Does anyone know where I can get this in Bristol, UK? 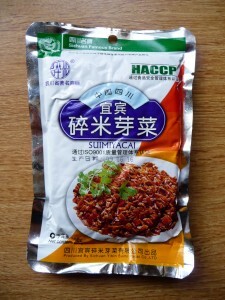 I have a large and generally good Chinese supermarket nearby (Wai Yee Hong), but can’t find it there – they do have pixian chilli bean paste though. My experience of trying to ask (both customers and staff) for help finding it was just as Fuchsia and some of the commenters here have described – confusing for everyone, especially when I insisted it wasn’t bean sprouts or zhacai I was after. I’ve tried using tianjin preserved veg instead, and though it comes in a really cool jar, it hasn’t given the dishes the taste I remember, it’s also really, really salty – even when I’ve rinsed it first as Fuchsia suggests. Of anyone is looking for it in Munich, I just found it in Shanghai Market on Herzogstraße, near Münchner Freiheit. Fuchsia, Every Grain is just fabulous. I’ve been cooking from it ever since I got it and my homesick-for-China ex-expat sister-in-law leafed through it wistfully and said her Ayi had cooked almost all the dishes in the book.